CBSD Control Project has helped install screen houses in Rwanda and Burundi with a holding capacity of 25,000 plantlets. They will serve as multiplication centers for basic and pre-basic seed. The team of scientists and development partners involved in the project met to review the progress made during the first year of implementation. The CBSD Control Project is funded by the International Fund for Agricultural Development (IFAD) and started officially in April 2017. IITA scientists led by Silver Tumwegamire are working closely with national cassava research scientists as well as seed regulatory bodies both in Rwanda and Burundi to deliver on the project’s planned activities. The project is implemented in Burundi and Rwanda, in partnership with the Institute of Agronomic Sciences in Burundi (ISABU) and Rwanda Agricultural Board (RAB). “Our first priority has been to introduce elite cassava clones that show strong tolerance for both CBSD and CMD and then work with the national systems and development partners, including individual or groups of farmers to test them and later multiply the good ones for farmers,” said Tumwegamire, the project leader. 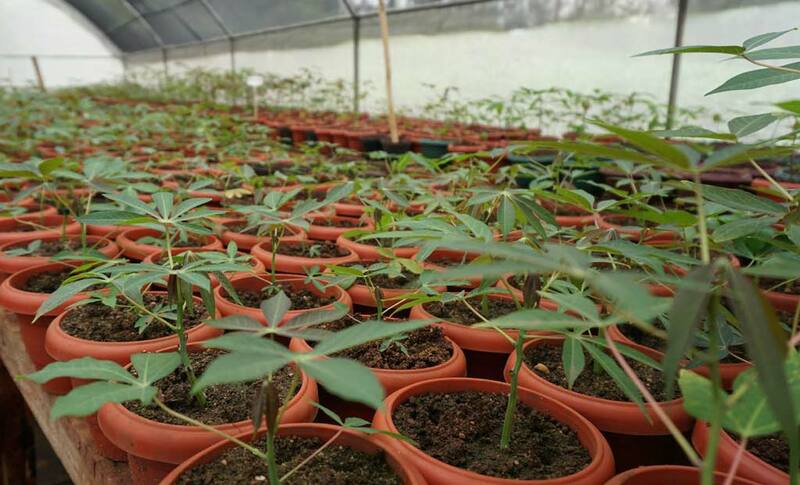 The project has so far successfully introduced 17 elite cassava varieties as virus-indexed plantlets which will form the basis for pre-basic seed multiplication after adaptive evaluations. The clones were selected from the 25 elite clones earlier tested in Kenya, Tanzania, Mozambique, Uganda, and Malawi under the 5CP project. The clones had earlier been pooled by the same countries, cleaned at the Natural Resources Institute (NRI) in UK and micropropagated at the Genetic Technologies International Limited (GTIL) in Nairobi before sending them back. The project aims to combat the destructive CBSD and CMD pandemics that have ravaged cassava in Rwanda, Burundi, and some parts of Eastern DR Congo. In four years the project—working together with national cassava researchers and development partners—is expected to identify best clones resistant to both CBSD and CMD and enter them into a clean seed system—at least the pre-basic and basic seeds. The CBSD project has helped install a new screen house for ISABU at Moso Research Station, and for RAB at Rubona research station with the capacity to hold more than 25,000 tissue culture (TC)-derived cassava plantlets. The screen house will later function as a pre-basic seed multiplication unit based on the virus-indexed TC plantlets. ISABU’s head of cassava research Simon Bigirimana expressed optimism in the gains the project has made within a short time. “In a few months we shall be releasing these new varieties for multiplication for the very first time in the country. This is a huge step towards fighting the CBSD attack on our cassava farms,” said Bigirimana. IITA through this project has provided training for RAB and ISABU technicians in tissue culture techniques and post-flask management to enable them to receive and manage the introduced germplasm. 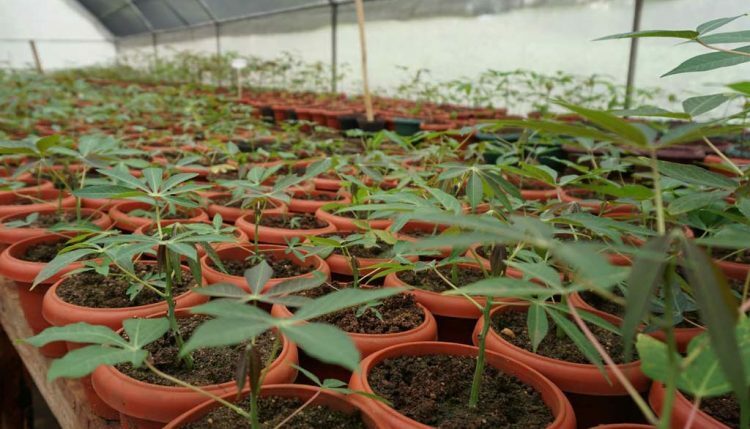 “With the introduction of the elite tolerant clones, set up of the research and multiplication facilities, we are hoping to address challenges posed by CBSD in the near future,” said Dr Athanase Nduwumuremyi, the head of cassava research in Rwanda. To tap into the existing diversity of germplasm in the two countries, the project has also spearheaded collection of local cassava germplasm to identify through genetic diversity studies parental cultivars with desirable traits and interbreed them with introduced elite germplasm. This will help countries to generate new clones that combine good traits from the local germplasm and CBSD tolerance from the introduced elite clones.